Figured I didn't have a photo album yet so it was about time to start one. 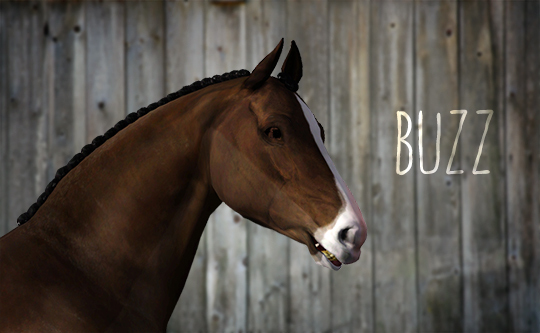 Pretty much a place to showcase my horses will probably mainly be show photos and random updates along with hopefully monthly theme contributions! Please see above links to learn about the establishment, horses and staff here at Sunny Creeks and who you will see throughout the album. 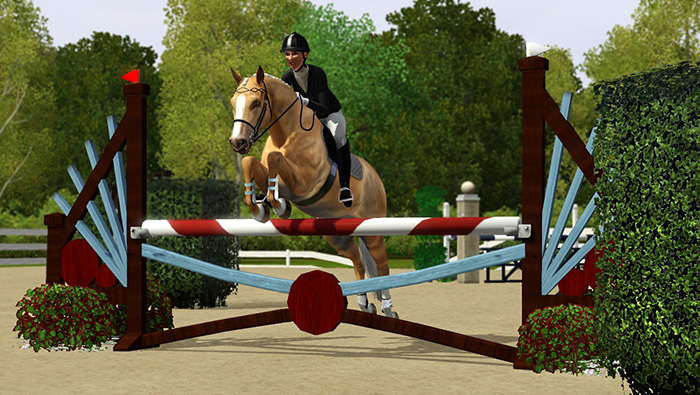 Sunny Creeks Ranch was located in Appaloosa Plains, a small rustic barn and a box home with just the necessities. The barn held two wooden stables and a modern one, above the barn a storage area along with a basic bedroom which was occupied in the later years by handyman and groom Johnny. The barn was enclosed within a small paddock where the horses grazed during the day. Cassie James (formally Blue) inherited this and two shires (Jasper & Macy) from her Grandfather who sadly passed away joining Cassie's grandma. They owned Jasper and Macy since they were youngsters and they both raised and trained them for general all round riding and the occasional drive. 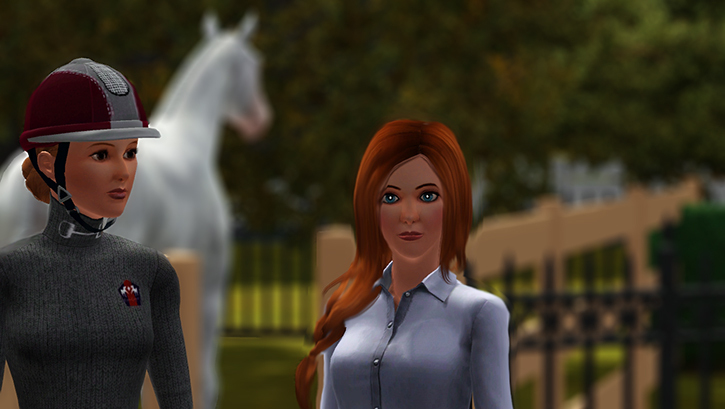 Cassie had just finished college at the time and suddenly found herself with two horses to look after and feed along with learning the ways of the world. Now don't get me wrong Cassie had been riding since she was small, it was in her blood as both sets of Grandparents and her mother were horsey. Her mother left when she was just a child to travel and compete leaving her with her father and grandparents. But at just 18 it felt like a huge responsibility. 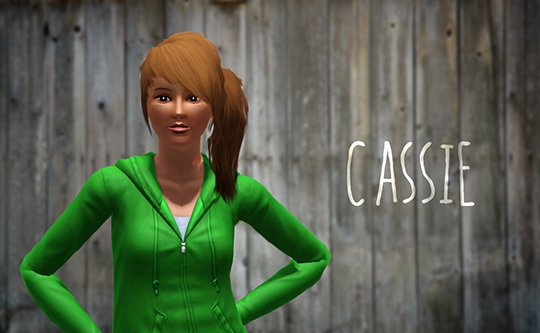 Cassie stayed at the ranch for 3 years, slowly over time doing some light refurbishment work to make it feel more like home. She carried on riding Jasper and Macy and doing some small competitions using a number of facilities around the town to ride and train. After two years at the ranch she met Johnny who was looking for a job as a stable hand, he moved into the loft and helped with day to day care and maintaining the ranch. The pair became close fairly quickly and became an item. 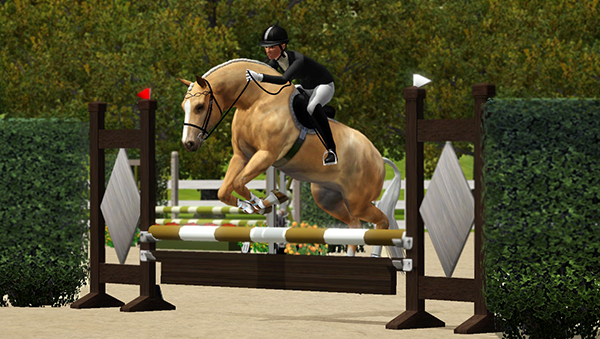 Cassie's dream is to compete horses across English disciplines and move up the ranks along with producing and selling. Starting off with showing the shires to gain experience, she soon realized they were much too old to be living an active life and made a hard decision to do what's best for them and they went to do a less demanding job at a small riding school on full loan. They had a quiet life and loved teaching the adults and children to ride and spent a lot of time grazing in the paddocks. Unfortunately, they have now passed after 10 years of service. In the later years Cassie rented a paddock behind the house for new arrivals, as she was given Fleur a gift and had no room at the farm. Fleur was joined by Gamble a rescue horse. 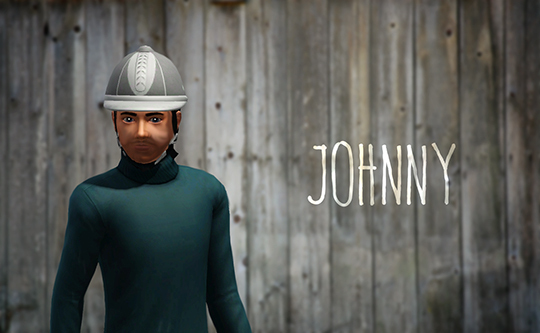 With Johnny's help she broke Fleur in and trained her in Dressage and Show Jumping and they also worked with Gamble and put weight on him and he eventually went on to Event. 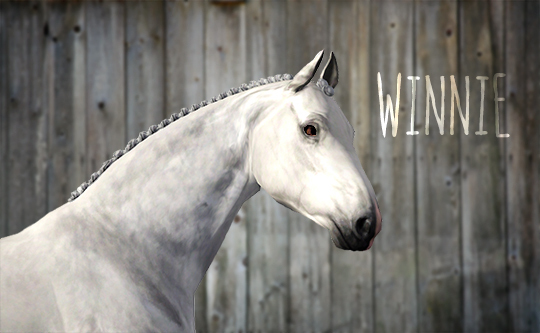 Unfortunately that winter there was a bad storm with tore down the barn and home forcing them to move. The team moved to Silverdale Valley and stayed in a temporary home whilst on the search for their perfect home. Whilst there Cassie acquired another youngster (Ellie), eventually, the lease was up and they had to move, yet again. They stayed in the valley and moved just a mere 10 minutes down the road. This place was smaller with only 4 stables instead of 8, a much smaller home and smaller paddocks, although small it's easier to manage than the big estate previously. The pair have been here for some time now but still searching for the perfect home, now married with a perfect little boy Theo. 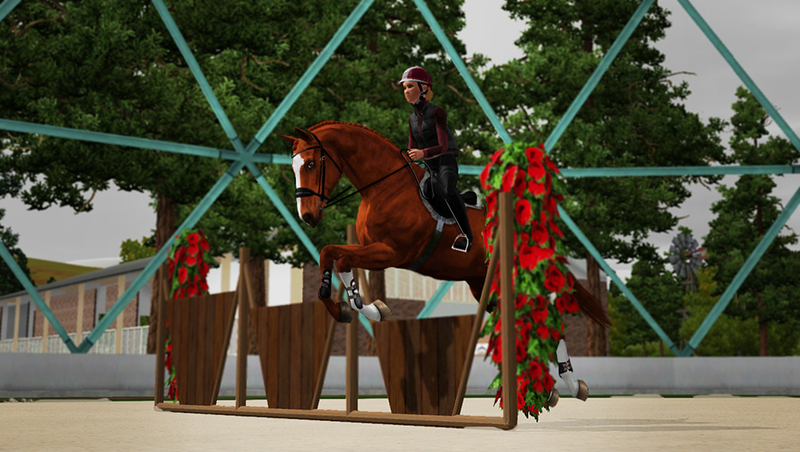 Cassie now hopes to devote her time to competing Ellie and Fleur and teaching Theo to ride. 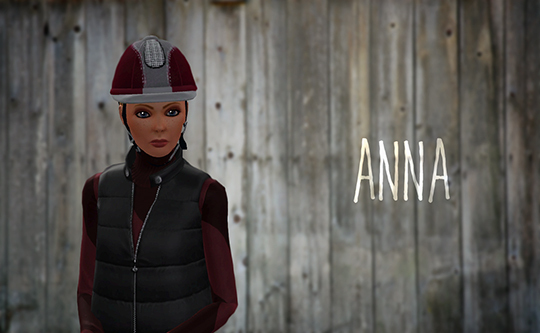 Anna Johnny's sister has joined the team with her horses Ash & Tris though they currently live offsite. 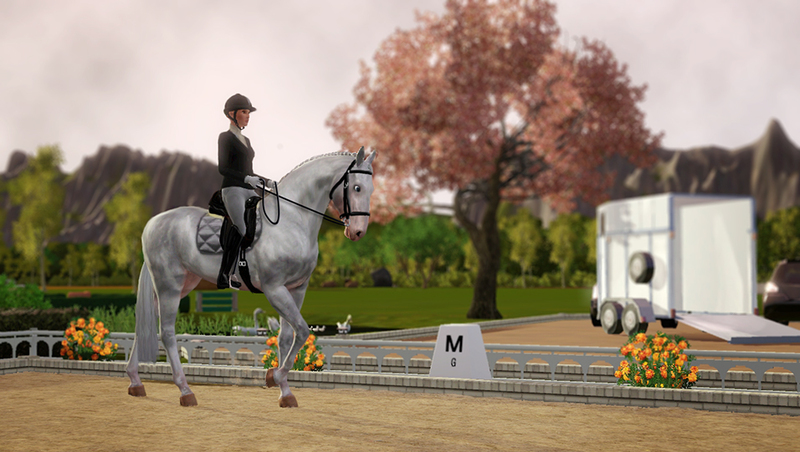 I would like to do a bit of breeding and have some homebred foals to continue the lines of Ash, Ellie, Fleur and Tris. 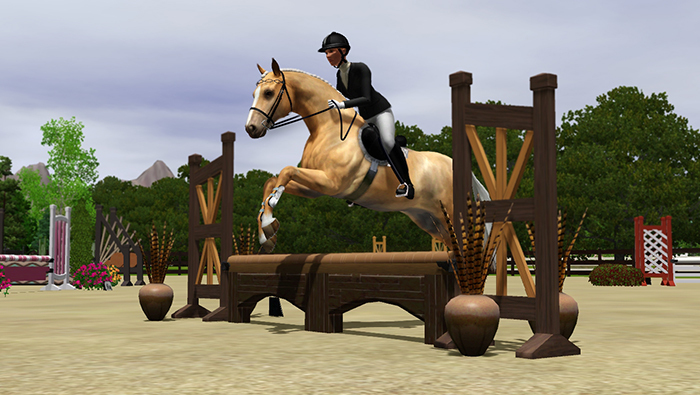 We also plan to buy two warmblood youngsters to train and compete and eventually breed. Role/s: Owner, Manager, Rider, Trainer. 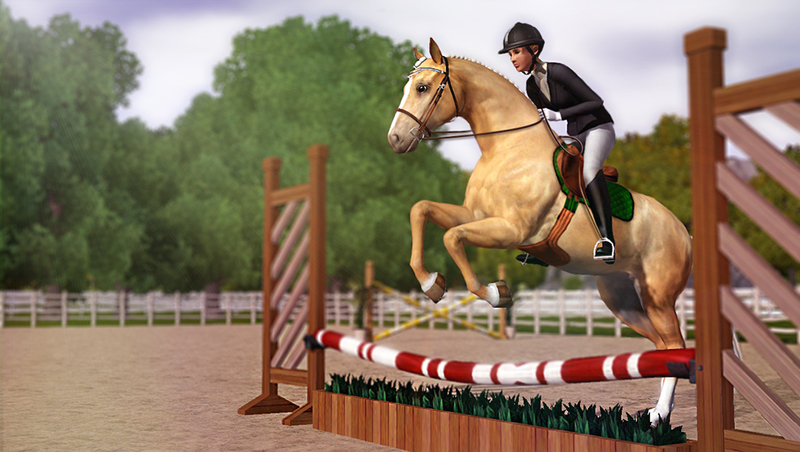 Traits: Brave, Equestrian, Loves the outdoors and perfectionist. 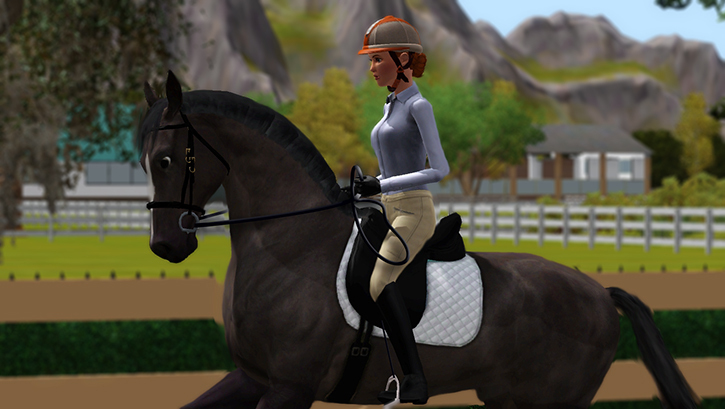 She very experienced with training multiple horses. 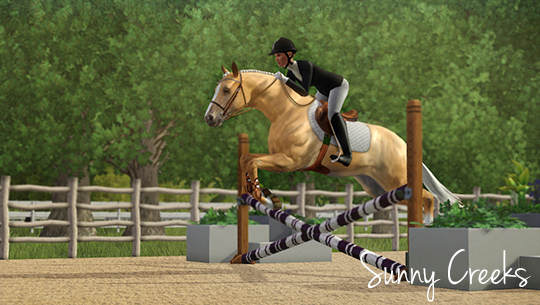 A bit about her background, she started riding very young and completed at the age of 8. 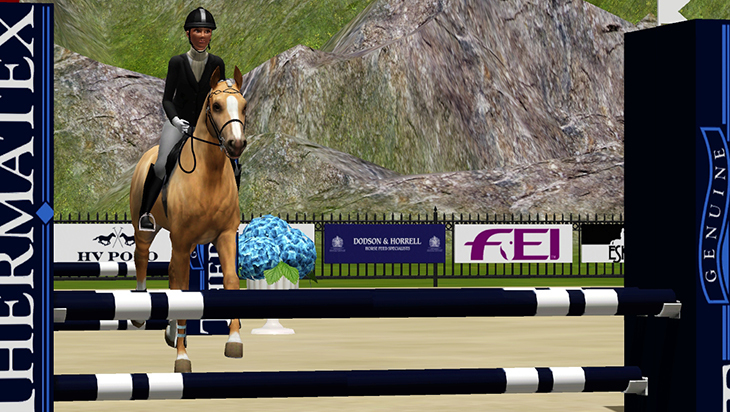 She entered variety of Advanced Eventing shows by the time she was 15. 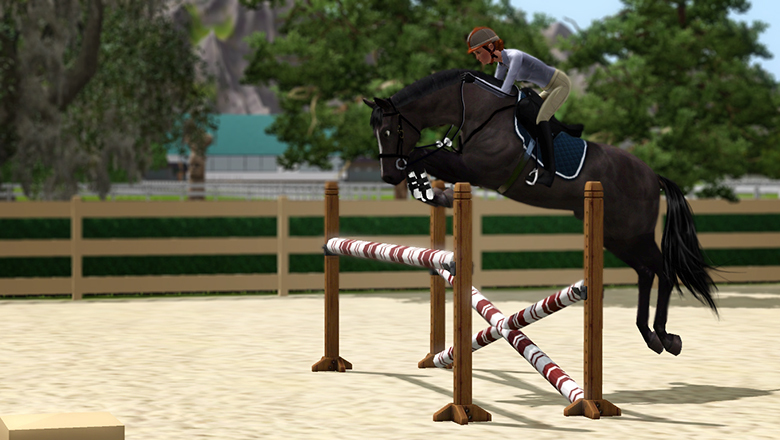 Eventually working her way up to Grand Prix Eventing. She is very athletic and has a lot of discipline, you can expect a lot from her. 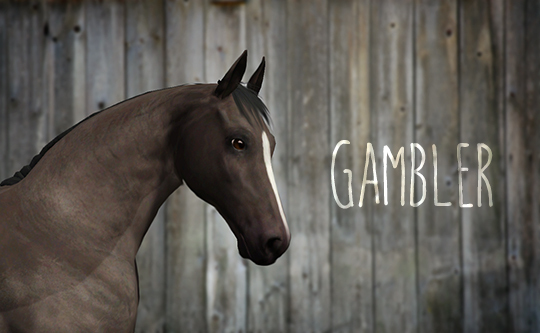 Gambler was giving to us from Wingate Farms from the feedlot. When he came to us he was extremely nervy and timid and scared of people but never did anything nasty towards them. Since gaining his trust he has become a wonderful horse and a pleasure to work with. He is quiet and pretty much bomb-proof and nothing has fazed him so far. He's easy to work with in all ways and loves a good bath and pampering. Both Macy & Jasper left Cassie aged 20 to do light work in a riding school they served there for 10 years before sadly coming to the end of their days. They had a foal called Bella whose whereabouts is currently unknown. 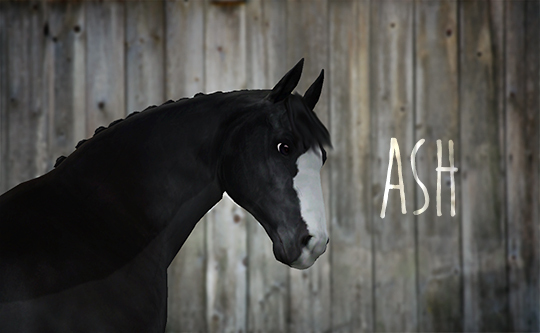 Ash is Anna's main competing horse. 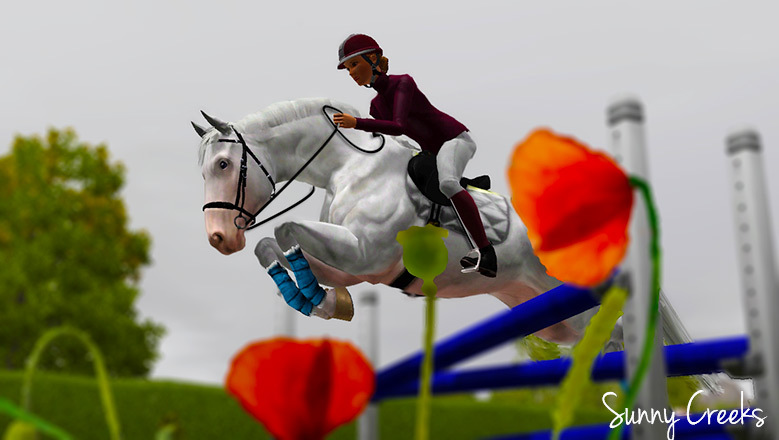 He lives to event and loves charging round the countryside tackling the jumps. He loves a thick bed and his owner as he is definitely a one to one horse. 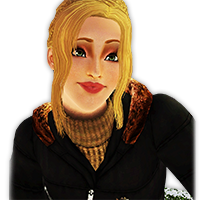 Ellie came from SLS as a 3-year-old. She has been successfully broken in and begun her training. 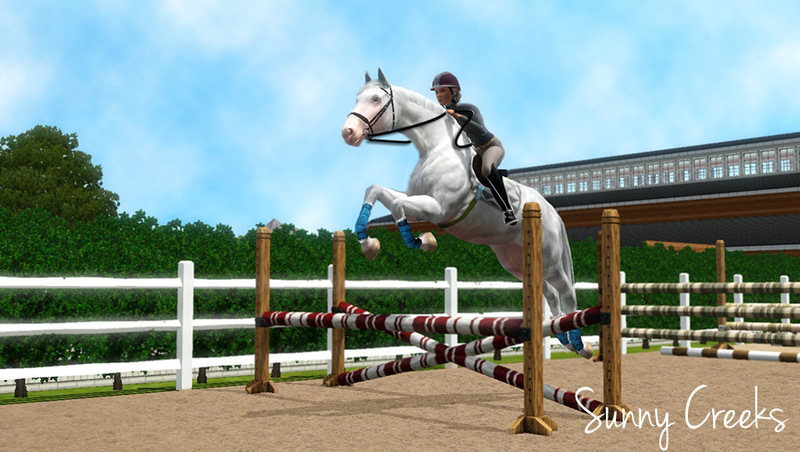 Ellie is quite forward to ride and finicky so needs a good rider otherwise you'll end up on the ground! She likes being groomed, carrots, a clean bed and pleasing her ride, she is also a bit of a princess and a diva! As she dislikes getting muddy! 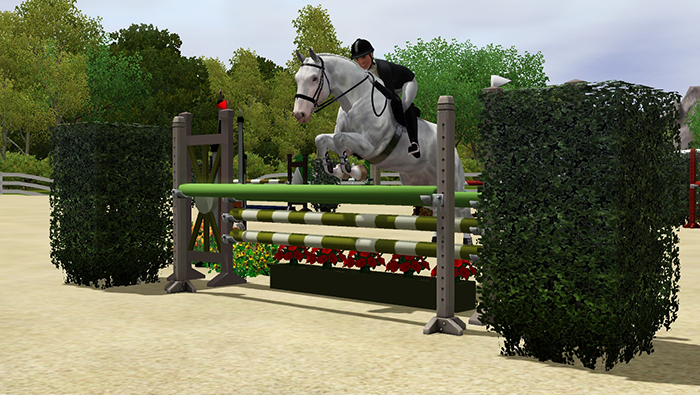 She competes in Show-Jumping and Dressage. 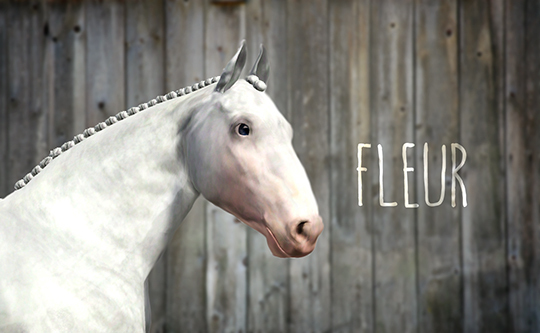 Fleur arrived as a gift when she was 3 and will be Cassie's main competing horse. She is rather excitable and small things get her on her toes though this may be due to young age and inexperience, we hope she will calm down over the years. Fleur currently needs to be lunged to get rid of extra energy but overtime we will change this. Fleur hates it when you touch her mouth, so needs a rider with gentle hands. Shes easy to groom, good with farrier, vet, easy to load, good with bridle but does nip when doing up the girth. 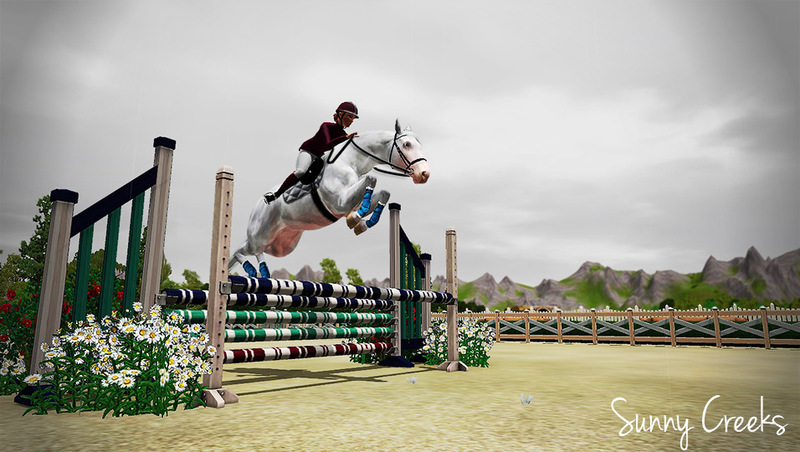 Fleur is very green at the moment and hopefully, with the right training, we hope to compete her in Show Jumping and Dressage. Tris came from Knightridge's Estate as a 5-year-old. 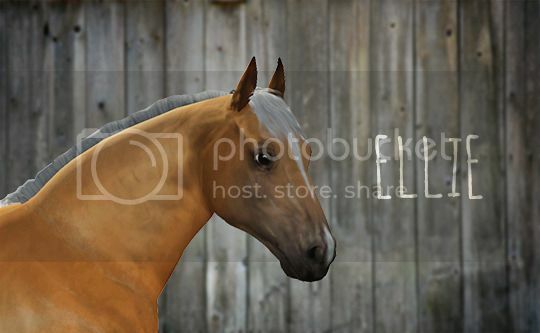 She is Anna's new horse and we are hoping they will bond well, like Ash she will compete in Eventing and Halter. She likes competing, neck-rubs and pears. 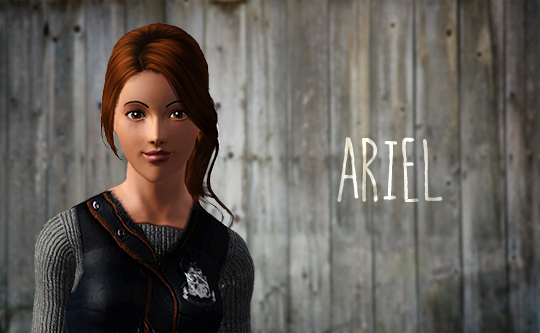 She dislikes thunder, lack of exercise and umbrellas and is scared of tractors and snakes!. She is quite excitable to ride! I'm extremely flashy and sometimes hard to control. 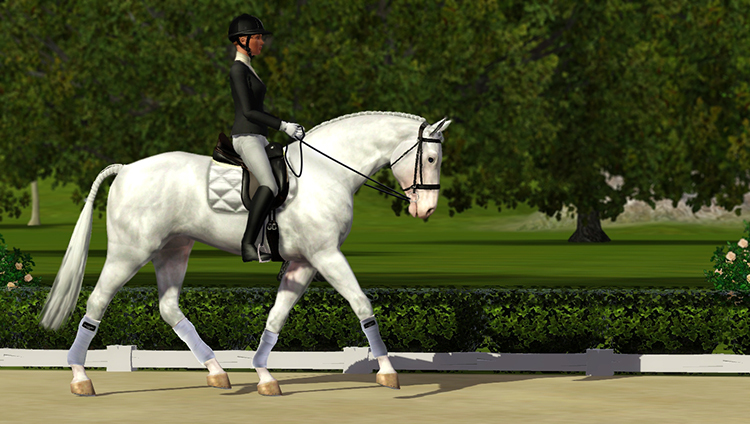 Personality: *copied from Henderson Thoroughbreds album - Rain (or Bubba, as she's called by Audrey) is a lovely mare. She's incredibly sweet and loves cuddles. She has a tendency to nuzzle everyone and will snuffle in your pockets for treats, though she knows her strength and is careful not to knock you over. 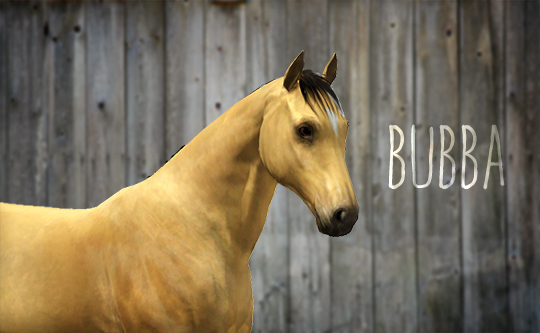 She's gentle and sweet, though she can be a little jumpy (pun intended). She is particularly nervous around trailers, which makes transporting her difficult. Rain adores peppermints and licorice, so be sure to keep the packets well away from her reach! 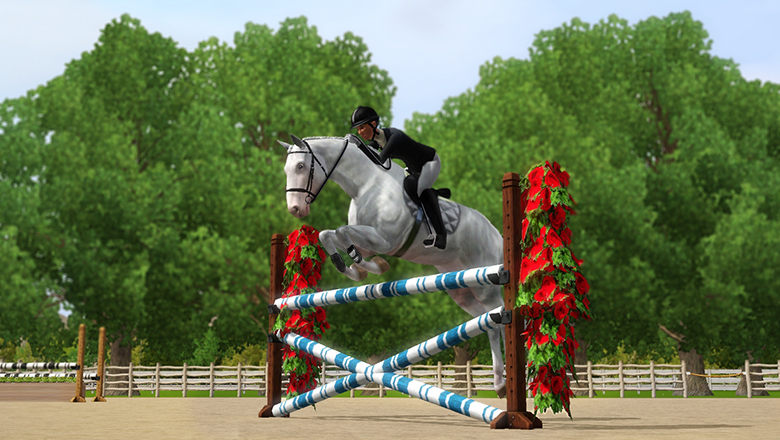 This mare is a favourite amongst the HT team, and is usually loved by anyone and everyone she meets. Tris is Anna's most recent addition and she absolutely loves her and can't stop talking about her to me on the phone. I can't wait to meet her (and possibly have a ride - cheeky ol me) she certainly looks a star! 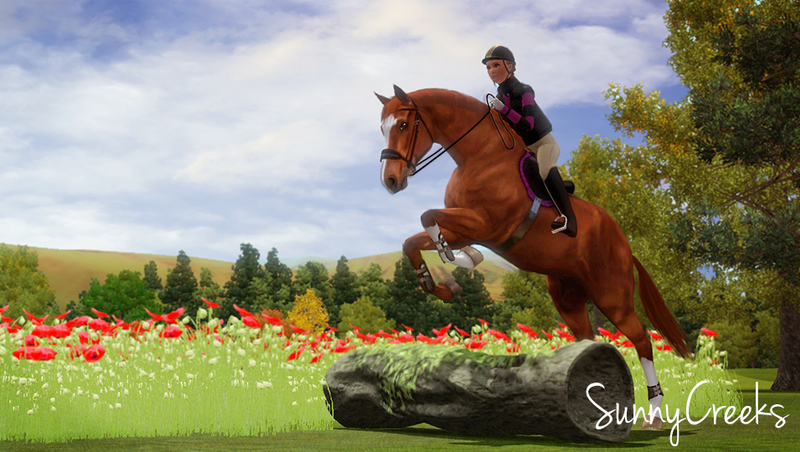 Anna emailed over some pictures for me to share of them practicing SJ & XC so thought I'd share them with you guys. Hopefully, she'll send some DR ones over as well - though Anna can't stand DR and tries to avoid practicing as she finds it 'dull' were her words, alas it's all part of Eventing the career she wants to take! She's a bit of a wild child and would rather be tearing around the countryside! I knew what I'd done as soon as the door was closed. I have no idea what on earth I just agreed to. I think I've just agreed to take on a teenager looking for part time work. Johnny's going to kill me... we are tight on money this month as it is, let alone paying someone else's wages! I was catching up on paperwork in the office when Anna barrelled in talking ten to the dozen about her friend Grace. Grace who, we've heard a few things about before... don't get me wrong she sounds nice enough but she's had a troubled and difficult childhood. Anna reckons it will do her the world of good and set her up on a healthy young adulthood to come work and compete for us. Anyway, Anna begged me to take her on a 2-3 month trail as Grace is really struggling for money and doesn't see the point of 'being here' if you know what I mean. Anna says it'll give her something to live and hope for. She's really struggling at college as well with bullies Anna informed me, resulting in Grace not eating. "She's a twig, Cassie she doesn't need to lose anything Cassie!" Anna exclaimed. "Her family don't want to know, she has nobody. Coming here and having her own project to work and compete with will do her the world of good, Cassie please" Anna begged. I sighed, "Anna we are struggling with money at the moment, I don't see how it's going to work in the long run, we can't afford to buy her a horse to work with and treat as her own yet either"
"Well can't we find a lease or something, do something at least. She can ride one of yours or mine in the meantime. Can't you come up with some sort of arrangement, take her on a trial at least, she's a hard worker I swear and she can ride well I promise. She gets on with all the nervous horses at college as she's so quiet and calm"
"I don't know Anna, I need time to think"
"Can you at least let her come and have a look round and a ride at the weekend; I already told her it'd be fine...please I'm scared what she's going to do, she my best friend I don't want her to do anything silly"
"I suppose it won't do any harm, maybe a lease could work but we will see"
A few weeks ago, Anna's friend from college came for a look around and a chat - more like an informal interview. If you'd read the previous post you'd have learnt a little bit about her and her circumstances. But me being me, I probed for a bit more information!. 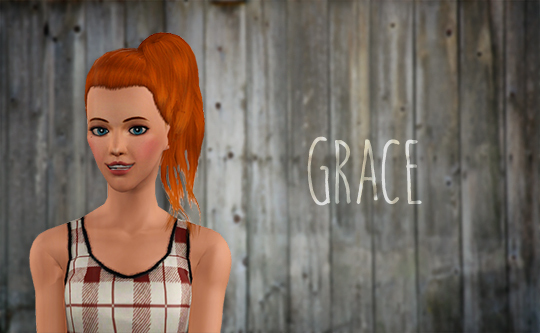 Grace is 18 and generally seems like a warm-hearted teen, she's rather shy and socially awkward, she chewed most her nails and scuffed her feet during the duration of the time she was there - must be nerves! She tells me along with having a passion for horses and wanting to compete and work with them she's also into environmentalism and ballet. She comes from a poor background 5 siblings and could never afford riding lessons as a child so most of what's she's learnt is from being at college for two years. She's not close to her parents or siblings and just has a close relationship with her grandmother. She's a little tall and somewhat thin and prone to loss of appetite when bored and is also prone to stuttering. Overall she seemed to lack a lot of confidence with people but being quite all the horses seemed to love her. I wanted to see how she rode but didn't trust Ellie or Fleur as they are both quite sensitive so she had a ride on Gamble (who doesn't compete anymore, we use him for hacks and light schooling mainly). 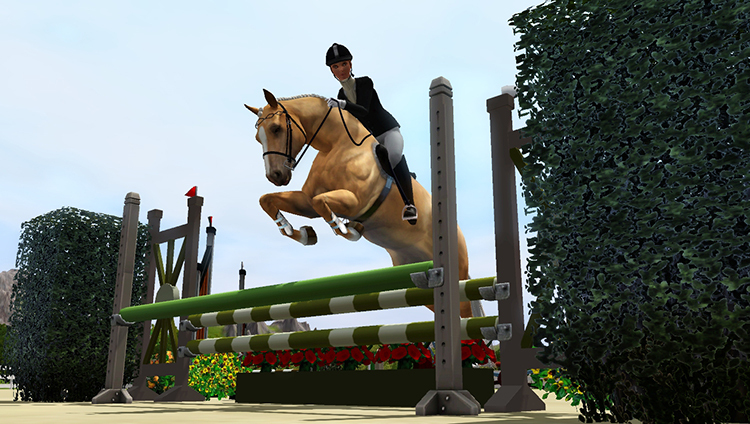 Her flat needs some work but she seems to love jumping! Anyway, I really liked her despite my previous impressions and I really want to see her grow and help her! I decided to take her on a trial of 1 month on a part time basis as she's still at college. Though she tells me she wants to head off to university next year so who knows where this will go. 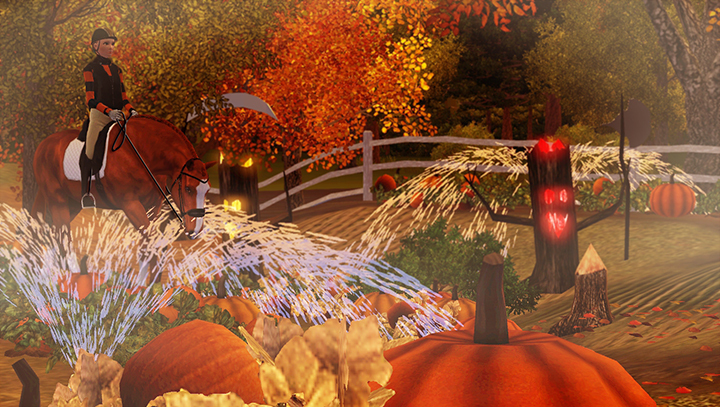 It was the early afternoon of Halloween, the smell of cinnamon, pumpkin, and spiced apple hung in the crisp air. 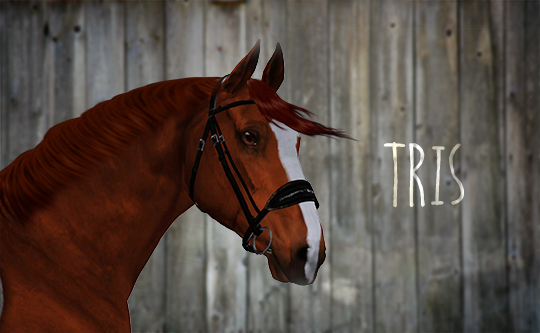 Anna and Cassie were stood in the warmth of Tris's stable getting ready for the evening's events. "Are you sure you don't want me to take Grace's place and come with you on the 'spooky' trial ride Anna?" Cassie questioned. "Oh please, I'm sure I'll be fine, it's for kids anyway can't be that scary can it?" Anna retorted. "If you say so, though you are entering the 'teen' section of the event, they could make it scarier. I'll leave you to it then. Are you wearing your dressing up costume for the ride?" "Ummm...no I'll save it for the fancy dress I think. I've got an orange and black jumper to wear instead"
"Okay, I'll see you after then, good luck"
The Halloween sun hadn't fully set; sweet wrappers blew across the leaf-strewn path ahead. Anna and Tris walked to the start of the trial ride. Anna sniffed the scent of pumpkin spice and caramel popcorn was overpowering. I can't wait for have some, Anna thought. The sun was setting thick and fast, the brightly coloured trees glistened in the light. I looked at the crumpled map in my hands, this can't be right I must have taken a wrong turn. I should have passed the pumpkin field by now. An owl swooped low, landed in a nearby tree, hooting and flew off again. I jumped at the sudden noise; night was on its way. I noted the way the owl flew and urged Tris into a canter, clutching the map we took off following the path of the owl. It was windy in this neck of the woods, the trees moaned and leaves flew erratically it the air. As we reached the pumpkin field I slowed to a walk, as I looked at the Jack-O-Lanterns and trees, they seemed to be looking back at me. A slow creaking sounded behind them a slow shuffling of footsteps. Tris tensed awaiting instruction. I glanced around a scarecrow grinned at me twirling around on a stick. How did I not see that before? We walked a few more steps, the trees still watching my every move. The next thing I know water is sprouting from the ground. "What the" I muttered. "Come on Tris, the finish is just around the corner, it's nearly dark and I do not want to be out here when it does". We trotted the rest of the trail, past more scarecrows, a couple of witches and oh a ghoul lurking in the shadows (which was a little too realistic, to be honest). Rounding the corner and crossing the line on every tree sat the crows, their cries standing out. All lights were out, no pumpkins lit. Where was everyone? A light burst out the darkness, I saw something in the distance, or rather someone. It was a figure dressed in black robes and a rattling chain. Tris snorted. Let's face it; it was never going to be an ordinary day. @Audrey-Henderson Thank you very much! Haha I think if it was me in RL I'd probably be crying and shaking like a leaf haha! 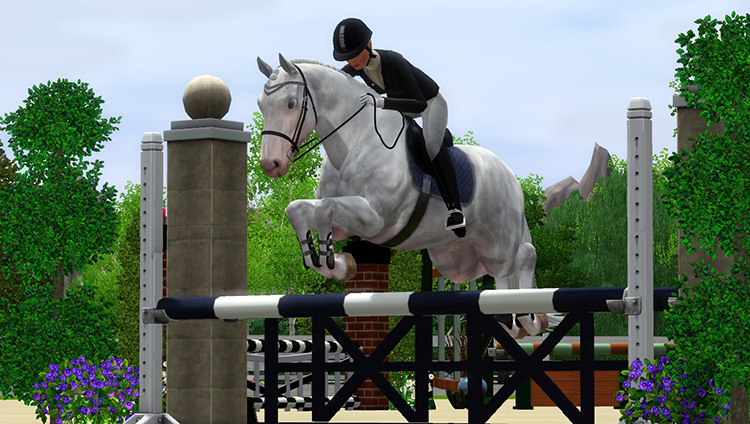 I'm going to do a couple of individual posts just a little showcase on each of my current horses in action! hehe thank you she is lovely and special to us as she is our first proper competing horse here at Sunny Creeks! Although as I am a SUCKER for Palomino horses, Ellie isn't far away!